The racing vehicles in "Cars 3" only have to deal with left turns and straightaways, but there&apos;s one important curve the movie must face: the one on which the movie will be graded. This third installment in this series about anthropomorphic automobiles is better than the forced silliness of "Cars 2," but it still lags far behind the animated magic of most of Pixar&apos;s work. The new movie brings the focus back on Piston Cup champ Lightning McQueen (voiced by Owen Wilson). McQueen is on top of the world, winning races and having a good time with his fellow veteran cars. But then a new high-tech generation of race cars takes over, led by the cool rookie Jackson Storm (voiced by Armie Hammer)  and McQueen wonders if it&apos;s time to retire. Not re-tire, as in get new tires, but quit the Piston Cup circuit. The billionaire Sterling (voiced by Nathan Fillion), Rusteze&apos;s new owner, has built a state-of-the-art training center to get No. 95 in racing shape. McQueen is assigned a trainer, Cruz Ramirez (voiced by comedian Cristela Alonzo), to put him through his paces. But he bristles at her modern motivational techniques and  after some arguing and a side trip to a demolition derby  takes her to find Doc&apos;s old trainer, Smokey (voiced by Chris Cooper). It&apos;s weird to watch a kiddie movie about a midlife crisis, especially one whose message is that the next generation should wait their turn until the old folks are ready to leave. But that&apos;s what is delivered in the script, a tag-teamed effort credited to Pixar veterans Kiel Murray and Bob Peterson, along with Mike Rich ("Secretariat"), and four more writers given story credit  including the movie&apos;s rookie director, Brian Fee (who has been a storyboard artist on "Wall-E" and "Ratatouille"). Like the first "Cars," which rolled through small-town America along Route 66, "Cars 3" is brimming with nostalgia for some mythic golden era of automotive excellence. Pixar&apos;s artists bring that world to life with incredible detail, as always, but it feels odd juxtaposed against cartoonish car characters. 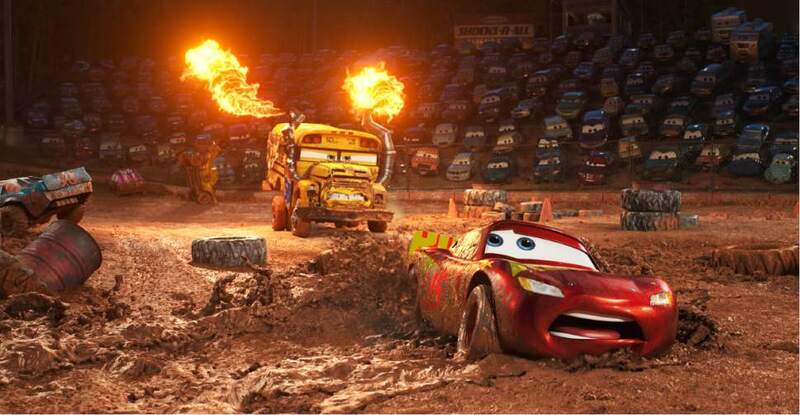 There&apos;s a fair amount of dead air in "Cars 3," from the antics of McQueen&apos;s buck-toothed pal Mater (voiced by Larry the Cable Guy) and a stats-spouting racing expert (voiced by Kerry Washington). But there&apos;s enough gas in the tank, barely, to give McQueen one last trip to the winner&apos;s circle. Lightning McQueen considers the end of his racing road in this continuation of Pixar&apos;s automotive franchise. When • Opens Friday, June 16. Running time • 103 minutes, plus a 6-minute short, "Lou."